Jimmie Johnson led 80 laps on his way to his 82nd career Cup win and his second victory at the Bristol track. The victory moved Johnson another step up NASCAR’s all-time win list, putting him win behind Cale Yarborough and two back from Bobby Allison and Darrell Waltrip. Clint Bowyer, Kevin Harvick, Matt Kenseth and Joey Logano rounded out the top-five finishers. 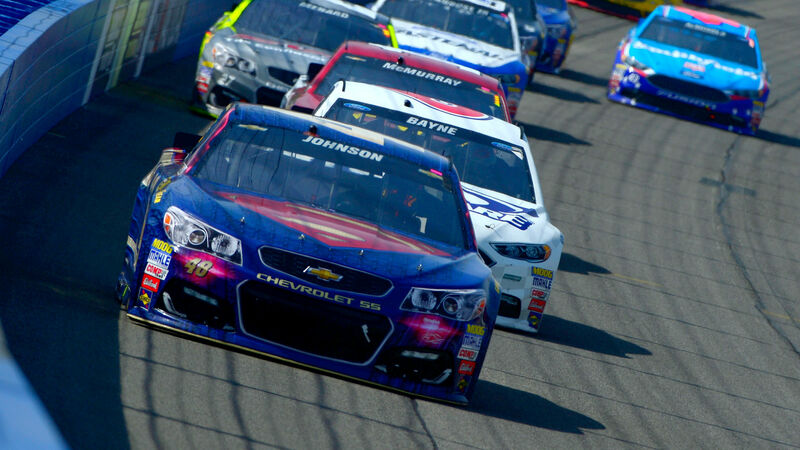 It was Bowyers best finish since finishing second in the 2013 spring race at Richmond International Raceway. Pole sitter Kyle Larson seemed destined for a top-five finish after leading the opening 202 laps and grabbing a Stage 1 win, but a pit-road speeding penalty on Lap 423 knocked him back to 17th in the field. He rallied to a sixth-place finish and held onto his lead in the season-long standings.A speeding penalty on Larson late in the race allowed Johnson to get the upperhand. “I knew I gave the race away there,” Larson said of the speeding penalty. “I was surprised that I was able to line up with an opportunity there at the end. I think even if I was able to get to the lead, I don’t think I would have won because Jimmie and Clint were way faster than I was. Dale Earnhardt Jr. was running 20th with just under 300 laps remaining when he wrecked during a restart after a mechanical issue. He didn’t return to the track. Ford drivers Brad Keselowski, and Ryan Blaney both spent extended time behind the wall with steering issues.